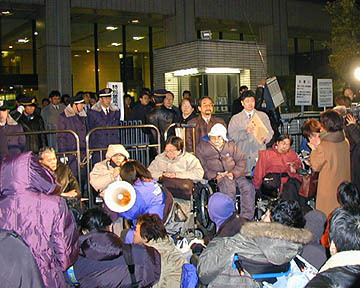 The Ministry of Health, Labour and Welfare’s decision to restrict the provision of financial aid for home help services for disabled persons from FY 2003 (starting April 1, 2003), met with strong opposition from organizations of disabled persons. On January 27, the Ministry finally conceded to alter the plan so as to maintain the level of services which had been provided until now, by introducing an “adjustment subsidy” system as an interim measure. On January 16, over 1000 persons with disabilities gathered at the Ministry of Health, Labour and Welfare for a large-scale protest demonstration saying that “fixing regulations for the provision of financial aid will, in effect, set an upper limit to the amount of services which can be received”. On January 24, the Cabinet Office and the Special Committee on Disability of the Liberal Democratic Party held a joint meeting to discuss this issue. At this meeting, the representative of the Ministry of Health, Labour and Welfare commented that the regulations for the provision of financial aid are not meant to fix an upper limit, that the former subsidy will be maintained 100% by introducing an adjustment subsidy, and that these measures will be explained at the conference of the prefectural directors to be held on the 28th. The adjustment subsidy system was explained to be an interim measure. In compliance to the strong request from the disability sector, the Ministry promised to establish a special committee to consider the issue of home help services for disabled persons some time after April, and that disabled persons actually using the services will be included as members of the committee. The committee will also study and analyze the actual situation of home care services as well as ways to revise the system of providing financial aid. With such concrete measures from the Ministry, the protest demonstration subsided. 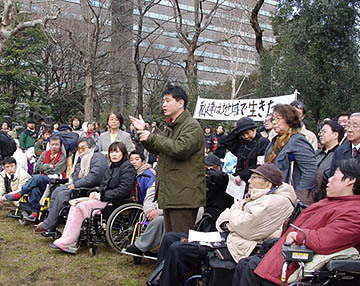 On the 28th, a meeting was held at Hibiya Park in Tokyo to report on the results of the joint action by the disability sector. The decision by the Ministry of Health, Labour and Welfare to withdraw the plan to set an upper limit to financial aid and to maintain the present support level is a big success resulting from the joint action and cooperation of the disability organizations.